The most common symptom of rose rosette is “witches’ broom” which is stubby, soft stems with elongated leaflets and stems with deformed, crinkled and brittle leaves that are usually brown or red with yellow mosaics and red pigmentation. Stems may show black blotches. The look resembles herbicide damage such as caused by glyphosate (Roundup) or 2, 4-D, or serious nutritional deficiency. This disease has been seen especially on the ubiquitous “Knockout” roses but will attack most other kinds of roses as well. 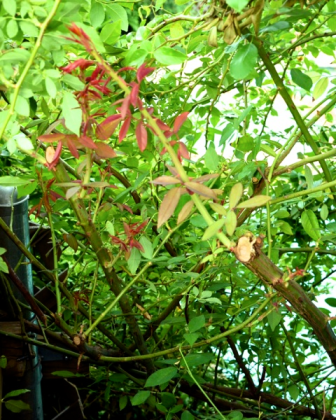 Other symptoms are thickened, succulent stems and a proliferation of thorns. As with most plant illnesses, this disease causes the plant to be more susceptible to freeze damage and excessive heat. University scientists and all the websites I have found on the subject contend strongly there is “no cure.” Gardeners are advised to remove the entire bush, including its roots. 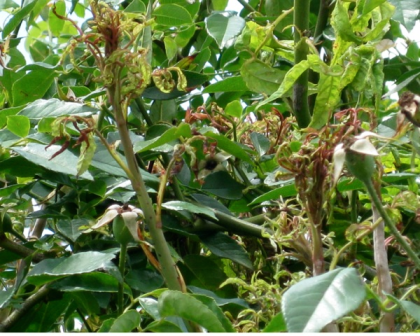 The disease, scientists say, can persist in root pieces left behind from the diseased rose. Obeying the recommendation, some of the local extension agents have removed their plan. Joanne Brown from McKinney, Texas called my Sunday show and told me about her problem, and it was evident from her description that the problem was indeed Rose Rosette. She said she had been advised to remove the plants. To 1 gallon of spray with Garrett Juice Plus add 8 ounces of 3 percent hydrogen peroxide (available at drug and grocery stores). To Garrett Juice Plus spray add 2 ounces of orange oil. To Garrett JuicePlus spray add 1 tablespoon of Bio Wash. Spray the plants thoroughly. I also asked her to send photos. She basically used a mix of all additional amendments. This is a close up shot of the infected bush after pruning, treatment and healthy regrowth.